This easy, quick and delicious Jowar Dhani Na Ladoo/Ladu recipe is a no-brainer, just requires a bit of skill and voila, you have a wholesome and irresistible snack for you to munch anytime. These crunchy, healthy and yummy puffed sorghum (Jowar) dhani ladoo are only prepared with 3 ingredients and can be enjoyed by the young and old. Being a British-Asian we follow two cultures, Indian and English and there is no problem with that. We choose whatever is best from both cultures. One of them is festivals, which appears one after another and makes our lives full of happiness, joy, and closeness. As soon as the new year celebrations finish, Indian Festival Makar Sankranti comes and as that goes away, Valentine's Day makes everything rosy and then follows the Indian spring festival Holi, a vibrant, colourful and fun-filled festival that brings out a child in you :) so there is no ending of festivals of both cultures right up to the end of the year. The festival Holi also known as The Festival of Colours is a second most popular Hindu festival after Diwali and these both festivals are ancient celebrations. Holi festival is celebrated in the UK by Hindu and non-Hindu as well, normally in the temples but nowadays younger generation celebrates this colourful festival in Bollywood style as celebrating Holi in this manner has been more and more popular in recent years. In Gujarat, Holi celebrations continue for two days. On the first day people celebrate this festival by Prayers and visiting temples, many observe the fasts on the first day too. and with a large bonfire lit on that night, and performs puja by throwing grain such as popcorn, puffed rice, and coconut in the bonfire. On the second day, the same festival becomes a raucous affair for some younger generation as they throw colour powder at each other as a ritual and nobody seems to mind this it is all in good faith. We all know that all celebrations cannot be complete without any treats and same goes in my house too. Many Indian festivals are not celebrated the way they were celebrated in India, but that doesn't stop me from cooking a treat which I used to enjoy a lot in India. During Holi celebrations, my mum used to make Dhani Na Ladoo, such a simple, sweet and satisfying treat for us kids. Throughout the day us kids used to just roam around with friends with colour powders throwing at each other, then go back in the house, ate some of these Dhani Na Ladoo and were out again doing the same. The joy of these fun-filled days is incomparable and indescribable. 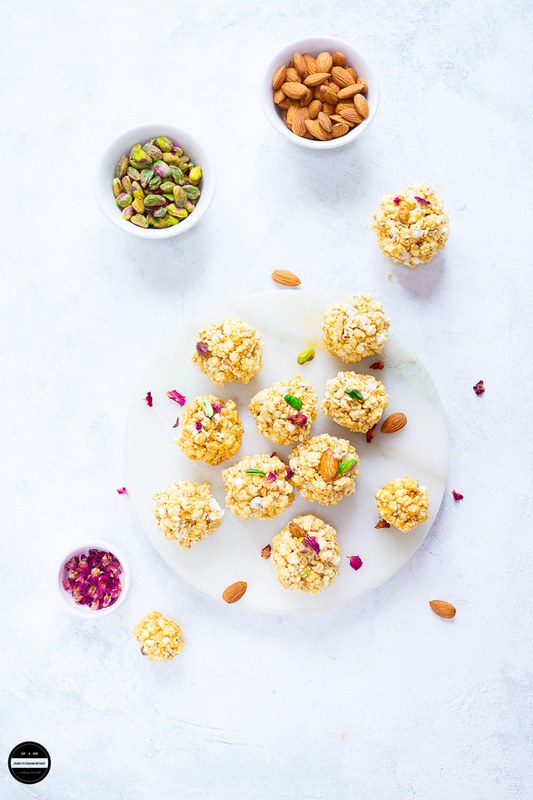 This year I am keeping it very simple and time-saving, so I decided to do away with different types of foods and just stick to one recipe which is Dhani Na Ladoo! If you don't want to make round balls of it, spread it on a tray and cut it as bars or just put one spoonful of mixture in cupcake liners and leave it to cool. Rose petals are for a photographic purpose only. Easy, quick and delicious Jowar Dhani Na Ladoo are healthy and made with a few ingredients. Perfect for snacking anytime. Dry roast Jowar Dhani on a low heat until crispy but not browned. Leave it aside.Heat ghee in a wide pan and add grated jaggery.Let the jaggery melt and make runny syrup.Once you have nice and runny jaggery, add roasted dhani and nuts slivers.Quickly mix well and turn off the heat.Remove the mixture into another plate.Apply little ghee on your both palms and quickly make round balls of this mixture. Be careful mixture will be very hot.If you can't handle the hot mixture, set in a greased tray and as soon as it is set cut into the desired shape. Sprinkle rose petals.Once cooled store in an airtight container.Enjoy! Oh this brings back memories of my childhood when my parents used to make this for holi. 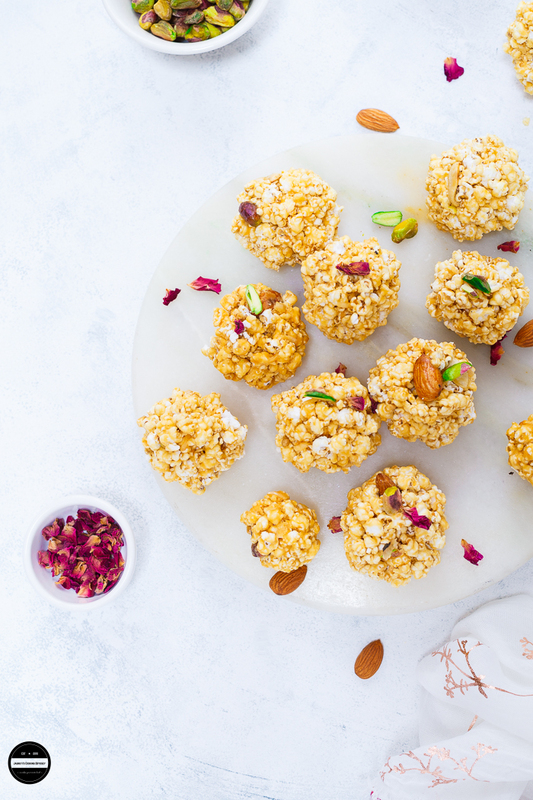 The addition of jaggery gives these ladoos a unique taste. Loved the addition of rose petals in Ladoo. Can feel the celebration of Holi in your post... Lovely and yummy ! Yummy laddus!Loved the recipe!Fab share dear! Honestly speaking all these holi posts are so encouraging and give that festive feeling. Loved reading your post and loved these Laddoos. Your clicks are amazing dear ! I am with you Swati on this..:) Thank you So much for a lovely comment. Thanks Drashti! Hope you guys enjoy these as much as we did. That is quite an easy recipe and honestly, I love jowar dhani or puffs. These are usually my mid morning snack at home as they are low in calories. Nothing beats the taste of homemade ladoos and I bet these are delicious with all the combination of nuts and jaggery. Wow I love it! Now I think I will be on a look out for the jowar dhani have not seen it here. Color color which color do you want! Hey holi is here. Your click is already celebrating the Holi. This year no celebration in my house as there will be board exams. Very tasty sweet snack for everyone. In have a savoury snack with this and will post it soon. I think I've seen jowar dhani in the Indian grocery but never bought it. This laddoo looks like a great recipe to use them. Crunchy, sweet and delicious. Thanks Pavani! Because these are smaller in size, you can shape them well. Thanks Nandita! During Holi period you can find Jowar dhani everywhere. Such unique recipe.. the presentation reminded me of what my mother used to make during Karthikai month. loving every bit of it. Thanks Avin! We too make same recipe with rice puffs ( Mamra ) on Makar sankranti. I have never seen jowar dhani before but seeing your post want me to go search for this unique ingredient. Looks so crunchy and delicious. Thanks Sapana..In Gujarat Jowar dhani is more popular than normal popcorn, May be you will be able to find in an Indian store as Holi festivities going on. Laddo and festivities go along so well. They looks so good. Thanks Afroz :) Happy Holi to you too. Thats so true Jagruti and I am so jealous of you that you are getting to enjoy two cultures. :) Just kidding! I love festivals for the food and this is so awesome. Even though we don't celebrate Holi, I am making all those treats. Lovely post. I have not eaten this in a long time, my mum used to make it when we were young kids.They look so delicious. Thanks Nayna! You'll be able to find Jowar dhani in Fudco, Wembley if you go around this time. These jowar laddu looking so tempting. making process itself seems so easy and quick. For kids thinking of making them on holi. Such a lovely ladoo.. 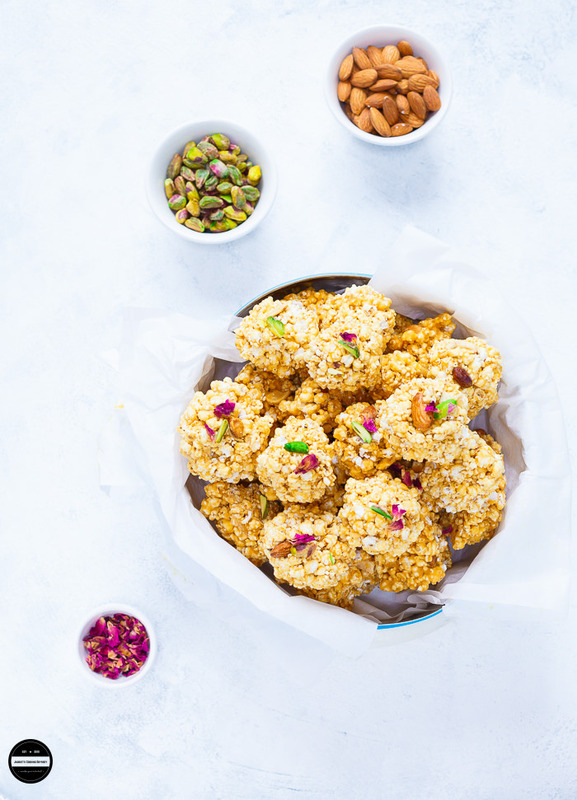 Perfect for holi and the coming festivals..
Jagruti jowar Dhabi brings back memories when I was little, we'd go to the temple with the family and I remember looking forward to the tiny popcorns. Little didi I know then that its made from jowar. Laddoos are just the right kind of treat for Holi. Did you pop the jowar at home? Thanks Mayuri, I remember when I found jowar dhani after so many years here in wembley the joy you should have seen on my face :) No, I did not pop jowar dhani at home. I tried a couple of times with the whole Jowar, but Unfortunately it didn't popped anything :( Maybe you need special kind of Jowar seeds ? Beauyuo bright pictures Jagruti! This is so new to me and sounds so simple to make. Bookmarking to try soon! Happy Holi dear!